Make a statement with our “High Fashion Horse” line of halters, featuring vibrant colorful designs printed on 100% polyester braid. Includes a special padded layer inside to create a cushioned comfortable fit! Available with an optional leather breakaway strap. Our Red Haute Horse High Fashion Horse product line is made in the U.S.A. Very happy with the material and original print!!! Down in PR stores tend to carry solid colored halters, this is a refreshing change from the same old styles! And the name tag makes it all the more special!!! Great ideas and prints great job!!! The halter ran a bit larger than I had anticipated, but better too large than too small. I'll just need to add another hole to the crown and it will be perfect. however, I am glad it has room since I also need a halter to put over the bridle while waiting for a class - that way I'm not hanging onto my mare's mouth while we're cruising around the show grounds waiting for our class. 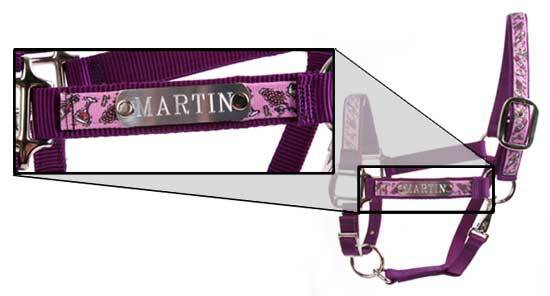 Click the button below to add the Personalized Name Plate Black Daisy High Fashion Halter to your wish list.